Leaky Gut Syndrome (LGS) has many triggers, making treatment a challenge. Dedicated research is nearing a solution for this costly livestock and poultry issue. You’ve got a heifer calf, feeder pig or broiler that, no matter how much it eats, is just not putting on weight like it should. The animal is not showing a single outward symptom of illness, leaving you at a loss in diagnosing the issue and treating its source. Maybe it just doesn’t have the growth potential of its peers. Maybe it’s genetics. Or, it could be an issue that, left unchecked, can erode efficiency and, ultimately, profit potential for producers. Leaky Gut Syndrome (LGS) is a subclinical infection affecting just about every ruminant and monogastric animal in the livestock and poultry sectors. The infection targets the structure of the small intestine, causing discomfort and leading to slow or weak weight gain. It creates conditions under which critical digestive system structures are damaged, intestinal walls become permeable and nutrient digestive absorption declines. It causes some animals to eat less, while in others, it simply causes more of the feed that’s consumed to escape through the digestive system before nutrients can be absorbed and the animal can gain weight. Once an animal has the condition, LGS doesn’t necessarily exhibit symptoms on a consistent basis – a major complicating factor for diagnosis and treatment. If happening with a high frequency, it does worsen with each subsequent case as intestinal tissues incur more damage. But those tissues do eventually recover if given enough time, usually in under two weeks. Some infected animals can live their entire lives without LGS becoming symptomatic. Antibiotics have historically been the most common treatment for leaky gut. But, antibiotic resistance and falling consumer acceptance are leading the industry to seek other alternatives. There’s no single source of LGS. Environmental stress, harmful bacteria and the consumption of mycotoxins are common causes of LGS in livestock and poultry, however. In general, animals become symptomatic when toxins that ordinarily are absorbed and excreted through the intestinal tract instead inflict damage on digestive structures like villi and permeate through intestinal walls. The toxins then enter other parts of the body and spread infection. In some cases, damage comes through the reaction of an infected animal’s body. Under normal conditions, a certain percentage of the energy an animal derives from feed is devoted to digestion. If LGS is present and opens the door for other infections, a larger share of energy may ultimately be directed at staving off those infections. This is a common source of economic losses from LGS, especially in cases when it does not become symptomatic. Leaky Gut Syndrome is common across different species, and its danger is two-fold, Mani says. Beyond the gradual decline in expected weight gain, infected animals are left more susceptible to other infections, both conditions that can lead to economic losses for producers. Environmental stressors – namely heat – are common triggers of leaky gut syndrome. Challenging conditions can lead the animal’s body to excrete hormones like cortisol that can inflict damage when absorbed into gut tissues or require more of the animal’s energy to combat, taking that energy away from weight gain. Like other toxins, these hormones can inflict even more damage if that absorption and resulting leaky gut occur with greater frequency. Gut tissues recover relatively quickly, but repeated bouts with LGS can cause a gradual erosion of those tissues when too little time passes between flare-ups caused by the environment. The absorption of toxins in feed can lead to similar tissue destruction. Aflatoxin in corn is a common mycotoxin that can promote LGS, even at levels well below the 20-parts-per-billion (PPB) threshold for acceptance into the feed supply. As little as five PPB can cause even a mild case of leaky gut to become symptomatic and lead to a decline in weight gain, Mani says. Historically, conditions like leaky gut have been handled with antibiotics. More recently, supplements like probiotics and antioxidants have been shown to help manage LGS, an increasingly attractive set of options as some sectors of the livestock industry face pressure to cut back antibiotic use or become antibiotic-free altogether. Because of the variability in LGS causes and triggers, however, it’s difficult to pinpoint the exact remedy that will be effective. 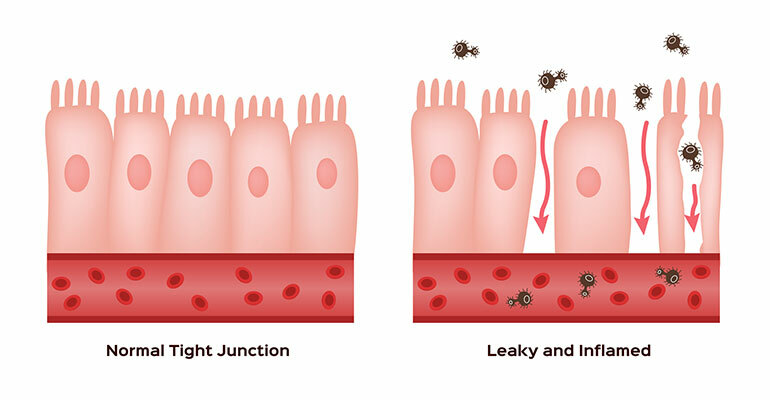 There are other products that have promise in managing leaky gut, not by targeting the specific causes or triggers, but instead by focusing on the basic structures they affect. Butyric acid, for example, can serve as a basic energy source for epithelial cells and tissues, like those that make up the small intestine. Higher levels of the short chain fatty acid have been shown to strengthen those epithelial tissues and the binding proteins between them, and increase antioxidant levels, which helps minimize hypoxic conditions that are favorable for leaky gut’s development. A new platform of products from Kemin offers an answer to preserving producer profitability while ensuring the animals meet evolving consumer demands. Encapsulated butyric acid feed additives from Kemin, ButiPEARLTM and ButiPEARLTM Z – which contains both butyric acid and zinc – combat the specific conditions that otherwise would be favorable to LGS. Kemin research has tested the positive gut health effects of supplementing diets with both encapsulated products, with consistent results. In research specific to poultry, the extended value of these findings starts to clarify. Supplementing with butyric acid and zinc decrease the triggers for leaky gut and has other positive health outcomes. The research results show that a product like ButiPEARL Z has the potential to both minimize the negative effects of these common stressors on overall gut health, and take on the specific physiological effects that promote damage from leaky gut. “If you are supplementing animals with ButiPEARL Z before they are exposed to heat stress, those animals may experience less stress. There is less damage than animals not supplemented,” Mani says, adding that more research can expose how such additives can help manage similar triggers for the condition. With the promising results the ButiPEARL products have shown thus far and research that continues to connect specific potential compounds with both the causes and effects of LGS, Mani says the use of antibiotics could be greatly reduced in an industry that’s facing mounting pressure to do away with them. Further research is on the horizon to explore additional benefits of alternative products. Check out the Kemin Gut Health Solutions product lineup and get your personalized solutions at Kemin.com/GutHealth.